During the Oct. 14 at the Vatican — very early morning in El Salvador — Salvadorans gathered in the square outside the cathedral to watch the ceremony on big screens; others watched in their parishes. St. Romero was shot dead while celebrating Mass March 24, 1980. His legacy of showing a preference for the poor and promoting peace lives on in his native El Salvador, where, even in death, he plays an outsized role in the country’s public life and occupies a special place in its collective consciousness — for devotees and detractors alike. He becomes El Salvador’s first saint. But his current role in the country transcends religion. He also has assumed the status of national hero, whose words — spoken in homilies — sound prophetic and seem apt almost four decades after his death. “He still is the most venerated and respected leader of the last 100 years, certainly the last 50 years,” said Rick Jones, youth and migration adviser for Catholic Relief Services in El Salvador. St. Romero’s slaying came as the country was on the cusp of civil war, which roared through the 1980s. His canonization comes as the country convulses with violence, much of it attributed to gangs preying on populations living in barrios under their control. As archbishop of San Salvador, the national capital, St. Romero accompanied the poor at a time when some two-thirds of the population lived in poverty. He also voiced people’s demands for better wages and criticisms of the “oligarchy” — as the elites were caustically called — at a time when his critics considered such talk “communist.” He also called for a suspension of U.S. military assistance. The poverty and inequality St. Romero spoke out against are still rife in 2018. Many Salvadorans also still flee the country to escape the violence and indignities, causing his words to resonate with younger generations and even some evangelicals and atheists. 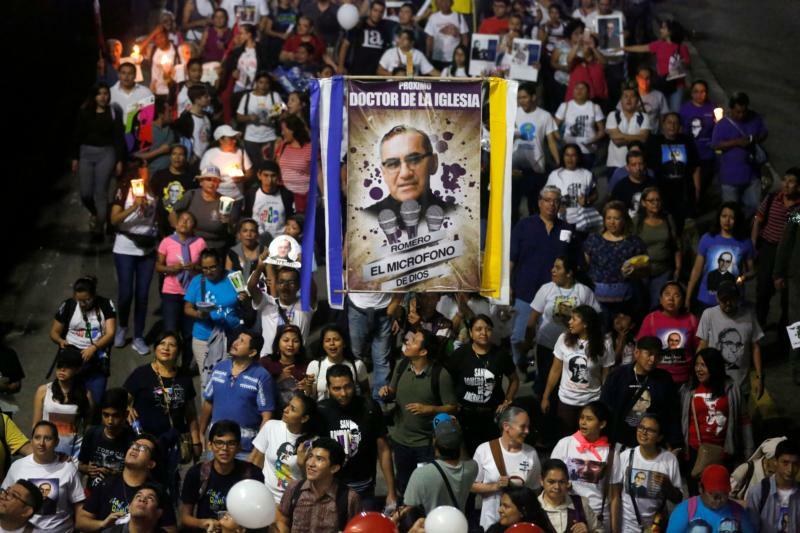 Canonization was never certain for St. Romero, though some in the country have long considered him a saint. “For me and for many people in the country — a good number of people with a social commitment — Bishop Romero has been a saint since his martyrdom, and now it’s going to be the formal act,” said Gabina Dubon, coordinator of the transformational social ministry in Caritas El Salvador. St. Romero served only three years as archbishop of San Salvador, yet he left a legacy via his homilies, which were broadcast across the country. Participants in a procession to the cathedral carried signs with quotes culled from those homilies. “There’s no more diabolical sin than taking bread from the hungry,” read one sign. “It’s necessary to call injustice by its name,” read another. The celebrations carried political overtones for some. A U.N. truth commission named Roberto d’Aubuisson, an ex-army officer and founder of the conservative ARENA alliance, as the intellectual author of the murder. He died of cancer in 1992. Father Ruiz stood outside the same cathedral where tens of thousands of Salvadorans mourned St. Romero at his funeral. Snipers opened fire on the funeral, killing at least 40 people. Only one Salvadoran bishop attended the funeral: Archbishop Arturo Rivera Damas, who was named St. Romero’s successor in San Salvador. Celebrations of the canonization occurred in dioceses across El Salvador — even in San Vicente, where priests would bless army helicopters during the civil war. Father Ruiz recalled being expelled from the minor seminary there in 2000 for refusing to stop displaying an image of St. Romero. Today, images of St. Romero grace everything from postage stamps to murals to the walls of the presidential palace to political ads, as the ruling party attempts to capitalize on his popularity and incorruptible reputation. That politicians try to appropriate St. Romero’s image bothers some devotees as crime, corruption and poverty persist at alarmingly high levels. St. Romero also criticized both sides of the political spectrum. Church observers expressed hope St. Romero’s canonization could bring unity to a country with polarized politics and offer a possibility of improvement. Copyright ©2018 Catholic News Service / U.S. Conference of Catholic Bishops.